Enemy Territory: Solid exploitation film that has garnered a real cult following over the years. A nerdy, white, life insurance agent visits a dangerous ghetto apartment complex to get a lucrative policy signed. On his way into the building he accidentally insults a junior member of the feared "Vampires" gang. When the gang's vicious leader, Tony Todd, goes looking for revenge one of his members ends up dead and war is declared. The bulk of the film shows our hero trying to avoid the street thugs and get out of the complex with his life. Lucky for the agent he gets some help from a gutsy telephone repairman, Ray Parker Jr, as well as a few of the scared residents. Jan-Michael Vincent has a guest appearance as the only white tenant in the building. He's a crazy vet with a fortified apartment filled with guns and, despite being a racist loner, he helps the outnumbered heroes. Future director Ernest Dickerson provides the camerawork. Filled with bloody violence and action this Assault on Precinct 13 meets 42nd Street mash-up is a winner! 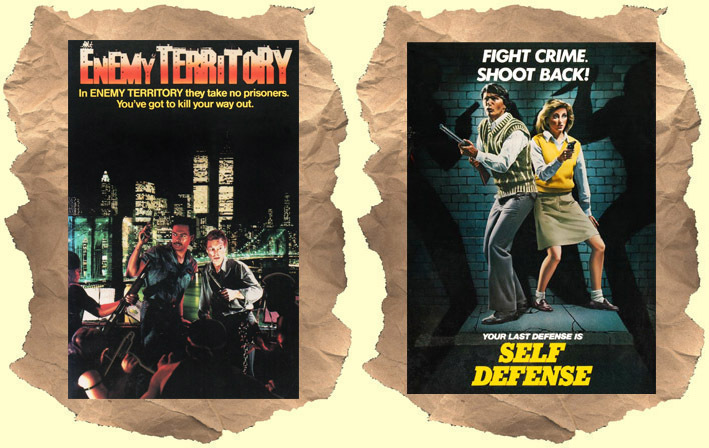 Self Defense: Forgotten Canadian exploitation that makes a perfect double bill with Enemy Territory. Taking advantage of a citywide police strike a gang of redneck-type goons visit an underground gay club to assault the workers and customers. One of the victims is accidentally killed and the group panics. They hold the others hostage and wait for their stone-faced leader to arrive. His solution? Kill all the remaining witnesses. Their plan goes awry when one witness gets away and finds refuge in a low rent apartment complex. The killers cut phone lines and electricity and lay siege on the building for the next 8 hrs until sunrise. The residents (including hero Tom Nardini) prove resourceful using booby-traps, homemade weapons and their wits to fight these urban bullies. Some clever kills and a twist ending.